My friends are so demanding. They bombard me with all these requests, like, “hang out with me” and “let’s grab some dinner” and even worse, “let’s do a happy hour.” Ugh, my friends are the worst. With that being said, I was again forced to acquiesce into joining a gal pal for a happy hour rendezvous in Green Bay. My girlfriend picked me up one random weekday and we headed out into the wild world. She wanted to hit up Boehmer’s Bar for cheap drinks and gossip time. Boehmer’s Bar is located in Howard just off of Velp Ave. They have a large parking lot which on a Monday afternoon might not seem so necessary but at night and during the weekends are very necessary. Boehmer’s is a hot spot for a bunch of my friends, and I’m assuming a lot of other people as well. They offer pool, foosball, darts, and lots of TVs inside. 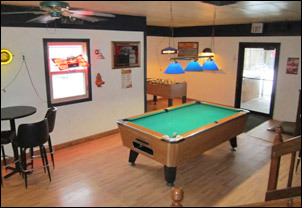 While outside (and during warm weather) they offer bean bag toss, another bar, and even a TV. Plus, you can smoke in this outdoor-backyard paradise, so smokers get excited. 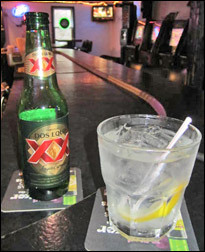 When my girlfriend and I walked in we were warmly greeted by the bartender, I ordered an Absolute and Soda while my friend ordered a Dos Equis. Since it was during happy hour, these bad boys were on the cheaps. They threw us back 5 whole dollars. Happy hour runs Monday to Friday from 3PM to 6PM, and it’s half off everything but shots. Sweet. On draught Boehmer’s carries Bud, Blue moon, Bud Light, Coors Light, Miller Lite and a Leinies. In bottles they have the usual Bud, Miller, and Coors products with more than a few other fan favorites such as Rolling Rock, Dos Equis, Redd Apple Cider, and more. They also have every type of liquor known to man, and then some. Seriously. Like, did you know there is a mango-something-or-other vodka? Yeah, me neither. But Boehmer’s has it, and their cool bartenders can whip you up a creative cocktail. Boehmer’s Bar was a cool place to go to for awesome happy hour deals, but I’m excited to check it out on a hot night when there’s a crowd. Errr, I mean, when my mean, MEAN friends force me to play again.